Why Patreon? Why not a GoFundMe or Kickstarter or Indiegogo Campaign? GoFundMe/Kickstarter/Indiegogo campaigns have their place for big, lofty goals. And while I have big lofty goals for Revision Path, I also have smaller, more attainable goals that can be reached along the way. And like I’ve stated before, I’m not convinced a crowdfunding campaign would be successful since these platforms are all-or-nothing, and they vary when it comes to how much money is taken out per transaction. This video explains more about how Patreon works. What is the money from Patreon going towards? Check out our Patreon page to see some of the other goals I want to accomplish! Outside of these things, your patronage ensures that Revision Path keeps providing you interviews every week and keeps the bills paid. But…Revision Path has sponsors. Big sponsors. Are you just being greedy and looking for more money? Revision Path does have sponsors from some pretty well-known companies. Those sponsors help keep Revision Path at the current level that it’s at (along with money out of my own pocket). So I’m not being greedy, but I am looking for more money. There’s only so much I can do with the show as I try to make a living as well. I want Revision Path to grow and become something big. The podcasts and interviews are great, but I want to be able to do more to really impact the design community. Events. Conferences. “On location” reporting. More episodes. Merchandise! All of these are not only things that I want, but it’s what I’m hearing from our audience as well. So in order to do that, we’re turning to Patreon. Because you’re asking for all this, I’m asking for your help to make it happen. Besides…do you really want the podcast loaded with five minutes of ads before jumping into each interview? That doesn’t really make for a great listening experience, and I know your time is valuable. What if I just want to make a one-time donation instead of paying you every month? Currently, Patreon doesn’t allow us to do one-time donations through their system; levels are set up so you can donate every month and keep receiving exclusive premium content as a reward based on your level of patronage. If you’d like to make a one-time donation, contact us and we’ll work something out. Note: Because of how Patreon restricts content to patrons, these one-time donations do not count towards any of the currently listed perks on our Patreon page. Why does one of your goals state that you want to do Revision Path full-time? Because I do. Revision Path has grown and changed so much since I started it over two years ago that it’s really become a calling for me. AIGA has heard us. Fortune 500 companies have heard us. I’ve presented at SXSW because of this show. I’ve talked about diversity in design at Weapons of Mass Creation Fest because of this show. Being able to expand Revision Path out of side-project status and into a full-time job is where I want to go so I can devote 100% of my time working with it, improving it, and growing it. No offense, but I don’t financially support any podcasts, even ones I like. This is just too expensive for me. You can do any or all of these, but they’re all free and each one helps out the show. Did I mention they were free? In all seriousness, I hope this post has helped to answer any questions that you may have about Patreon and why we’re doing this. If you still have questions, just send a message. Thanks! Support Us On Tugboat Yards! New Interviews Every Monday Findings from Our March 2014 Survey Help Revision Path Get to SXSW 2015! 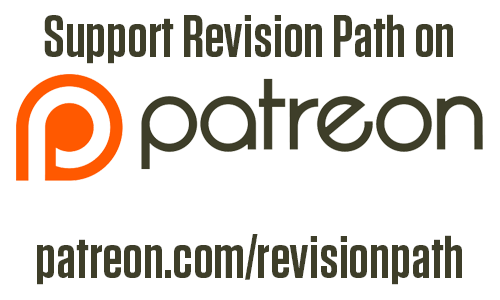 ← Be A Part of Revision Path’s 100th Episode!